Happy B2S! For the past three years, all my grade 6-12 students have eaten lunch at the same time. They have 50-minutes for lunch, and the students have lots of options for free space during this time. They can freely drift between the cafeteria, coffee shop, library, gym, several outdoor areas, lunch clubs, planned activities, and the boarding house. We have trivia contests, mini-talent shows, impromptu dance music, and just general hang time. I LOVE this 50-minute free lunch time for students, and I wish the USA would do this more often in schools. There is a duty schedule for teachers (because none are teaching at that time), which ensures all teachers get a lunch time and all areas are supervised. I do not need library passes, and I do not limit the number of students in the library at lunch. As a result, the library is packed during lunch, especially during the second half, when many of our 365 students are finished eating. Unfortunately, my Texas school did not have this extended lunch and free time for students. I suspect most middle schools are like my Texas school, where students' lunch time is strictly limited, mostly to inside the cafeteria. My Texas school was brand-new when I started there. In 2009, I had moved up from elementary library, and I started my tenure at the middle school with no particular policy about library lunch. I had never had any issues with student lunch visits at my previous elementary school, where I had loads of fabulous library volunteers, so I figured I'd just see how it went. Well, it went! This was a school of 850 sixth through eighth graders, and guess what? Once they discovered they could come to the library at lunch, I was completely PACKED. Since lunches overlapped with classes, there was often a class in the library during another grade level's lunch. Some students said they were going to the library in order to get out of the lunchroom and ended up roaming the halls or hanging out in the restrooms, where there was no teacher supervision during lunch. 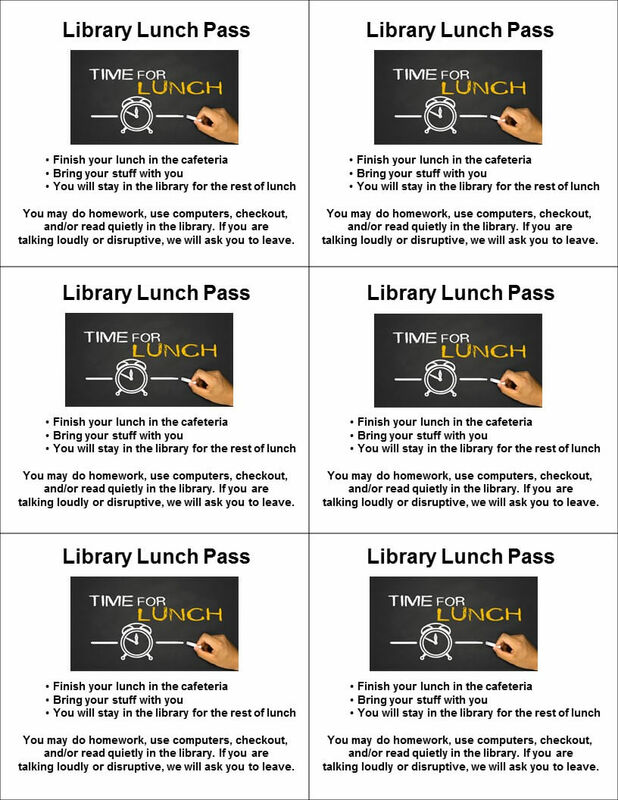 I quickly realized I needed some sort of organized system to keep the lunch numbers manageable and to ensure the students made it to the library when they left the cafeteria. Simple, printable passes (above). There are six passes per sheet. Make plenty of copies and use a paper cutter to slice them up. Using a due-date stamp, stamp the back of the pass each morning with that day's date. The pass is good for that date ONLY. This helped keep students from reusing the same pass for days or weeks at a time (important when you limit the number of passes you give out for each lunch). Do not bother laminating. I started out laminating the sheets, but it was a wasted effort. The passes were frequently lost, crumpled up, stepped on, or dropped along the way. You can't stamp the date on a laminated pass anyway. Print the passes on colored paper to make them stand out. Students needed to get their pass from me, specifically. When I left them out on the counter each morning, some students would take a handful of passes for their friends. This is inconsiderate of other students, and I did not allow it. If the friend wants a pass, he or she can come in and get one from me. Or they could talk to me about having a quiet lunch in my office with one or two friends (more about that in a minute). As with everything related to students and teachers, I always leave room for exceptions, but in general, it was one pass per person. Students should turn in their pass (I had a shallow box) when they sign into the library. 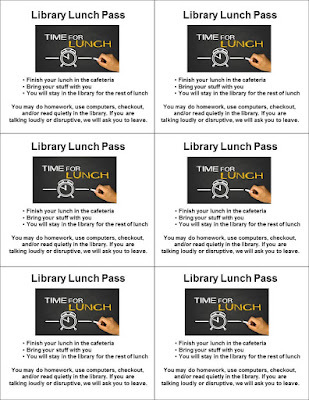 The number of passes should equal the number of students in the library for lunch. I would reuse these passes, with tomorrow's date stamp, the next day. Make sure your lunch monitors know to look at the back of the pass for today's date. If they aren't checking the dates, the students will start reusing the passes over and over. I always made my students eat in the cafeteria, then come to the library. They had to wait 10 minutes into lunch before they could come to me. This is how I did my part to ensure students were actually eating lunch. At least they had the opportunity to eat, and no one could come back and say that the student wasn't eating "because they were in the library." I have heard this far too many times over the years, as if it's my fault a middle school student might choose not to eat lunch. Grrr. Students sign into the library when they come in. I recommend this for any time students come to the library without their class. I've referred to my sign-in sheet many times to help our assistant principal determine whether a student was skipping class. If they said they were in the library, I could easily confirm or deny that. You can also track the number of students you have on any given day, and it can be used when compiling library reports or requesting additional library support during busy times. Some students just need to come to the library every day due to anxiety, social difficulties, or simply wanting to escape the loud cafeteria. For students who came every single day, I always had a pass available for them. If the limited passes ran out before they got one, I would just give them one anyway. Be flexible and open to what your students need at lunchtime. Many students struggle socially in middle school, and lunch time can be a great opportunity for you to help these students. I regularly let one small group of 2-3 students eat lunch sitting on the floor in my library office. I especially loved doing this for new students or students whose social issues were causing them lots of lunchtime anxiety. For new students, I would pair them with one or two other students who I thought would be welcoming to the newcomer. For students struggling with a personal or social issue, I allowed them to invite one or two friends to bring their lunch to my office. I would close the door (there was a large window), and give them a quiet place to talk. I even had homemade hot-tea mix on-hand that they were welcome to sip. Managing the library lunch crowd is doable, but you may need to try several things before you find a system that works for you. And don't forget to make time to eat your own lunch! Too many of us (myself included, so I get it) eat lunch at our desks or not at all. This is not healthy for you, and it is important that you plan to give yourself a mid-day break of some sort. Hang in there until you find a way that works for you, and take care of yourself! 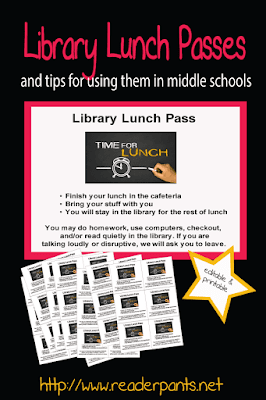 How do you manage lunch in your school library? Help new librarians by adding your experiences in the comments below! Leigh, Your post was very similar to what happened in our high school media center. The library was a refuge for students with social or emotional issues. Teachers and counselors contacted us for this and they knew where the students were. It was a good system. The student was quietly or silently greeted in a friendly manner. We required students to sign in, so that we had documentation. Sometimes the popularity was overwhelming because we had the best and most beautiful space in the school. Students behaved civilly. We took photos of students studying and reading, posting them on the bookshelves in frames. It was a way of showing we valued students. Wendy, I love the idea of having student photos all around the library, especially when they are in frames! Your students are lucky to have a librarian who understands their social-emotional needs. Happy 2017-2018!